Two out of three ghosts inhabit the almost Christmas release from Shovels and Rope as they choose a December date to unveil Broken Jukebox, Volume 2. Visiting the past, the Charleston, South Carolina band grab from songs that have meant something to them over the years, and collect friends in present time to offer covers of tunes from a wide-array of musicians and styles. Broken Jukebox is the second in a series from Shovels and Rope, who brilliantly release the albums between their own more-formal releases of original music. 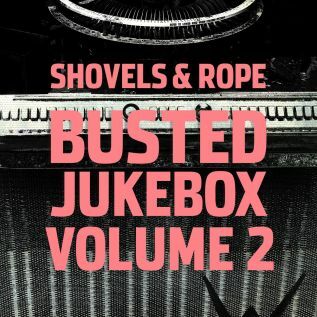 Opening Broken Jukebox, Volume 2 is a track from Bill Carson, who co-wrote “Cleanup Hitter” with Shovels and Rope, performed on the recording by Brandi Carlisle. Finger-snaps and the rhythm of banjo notes are the foundation for angelic harmonies and The Hollies cut, “The Air That I Breathe” from Indianola as Rhett Miller borrows from The Breeders with “Do You Love Me Now”, experimental Icelandic rock band Sigur Ros lends “Untitled 1” for an interpretation featuring Matthew Logan Vasquez and John Fullbright walks under heavy drops of notes that fall like rain on Leonard Cohen’s “I’m Your Man”. The choice of artists is curated as well as the song selection that Shovels and Rope collect, collate, and re-configure on Broken Jukebox, Volume 2. Guitar strums, snare drum beats, and thick guitar notes flutter and fly around Nicole Atkins as she re-dials “Joey” to give him the message originally left by Concrete Blonde. Stretching the boundaries covered by the songs, Broken Jukebox, Volume 2 slows Willie Nelson’s “Blue Eyes Crying in the Rain” to a dirge from John Moreland. Boiling rhythms bubble underneath Vera Lynn as she makes Faith No More’s tune “Epic” into a seductive tease and The Clash’s observations on extremes is delivered by Hayes Carrl with “Death or Glory” as Shovels and Rope close out the album with a reminder about how the dice fall in Chuck Berry’s “You Never Can Tell”.